After reading Derting’s other novels, I knew The Taking was going to be a book I wanted to read. It was different from her other novels, and after starting to read, I could tell it was either going to really pull me in, or I was going to struggle to finish it. Books that are connected to the science fiction genre are not usually my thing. They have to be done really well for me to enjoy them. Kyra was in the car, having an argument with her father about colleges, when she demands he pulls over so she can walk to her team’s championship celebration. Once out of the car, she vanishes. All she remembers is a flash of light, and then nothing. The next thing she is aware of is her being by a dumpster with no recollection of how she got there. When she returns to her home, she finds a man and a child she doesn’t know there. Across the street, where her boyfriend lives, she finds he is gone and his younger brother has grown up. 5 years have passed since she vanished and nothing is the same. Kyra is thrown into a new world where she doesn’t know what is going on. People want things from her; they want to know where she went and why she’s been gone for years. She’s become obsessed with time, not wanting to lose anymore of it. Her best friend and her boyfriend have moved on. Her family has been torn apart. She doesn’t recognize anything about her life now. She’s still 16 and trying to cope with everything. I find I was forgiving her for things I’d usually find annoying in a character. To me, her choices were understandable. She’s trying to fall back into a life that vanished. Her decisions wouldn’t always be the best, but she showed a maturity I was grateful for. The relationship between Kyra and Tyler seemed to develop just a little too fast for my taste. Yes, they had great chemistry and Tyler was a wonderfully sweet boy, it felt a little odd for Kyra tog o from viewing him as the kid brother of her boyfriend to imagining a relationship with him. I would have liked a little more development of the relationship between the two before it turned romantic. At times, despite being great boyfriend material, it felt like Tyler’s attempts to make Kyra happy felt more like a little kid with a crush instead of two equal people finding their way together. I don’t want to reveal too much of the plot because this is a book that needs to unfold at just the right pace. In all honesty, if I had known what one of the major plot points would be, I probably wouldn’t have read it. But Derting wrote the novel in such a way that it didn’t feel cheesy or wrong. It felt like it was a perfect piece of the puzzle. I’m really looking forward to what comes next. The cliffhanger has me anxious. 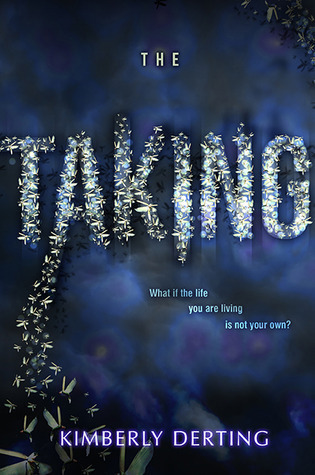 Despite a few flaws, The Taking was a good book that definitely pulled me in and has me ready and anxious for the next piece of the story. Derting has another great series on her hands. This entry was posted in Mystery, Thriller, and Suspence, Something a Little Different, Young (and New) Adult and tagged Fantasy, Kimberly Derting, Paranormal, Science Fiction, Young Adult.